BRIGHT AND EARLY Scientists caught an early glimpse of an exploding star in the galaxy NGC7610 (shown before the supernova). Light from the explosion revealed that gas (orange) surrounded the star, indicating that the star spurted out gas in advance of the blast. The skies are full of transient events. If you don’t happen to have a telescope pointed at the right place at the right time, you can miss anything from the transit of a planet to the explosion of a star. But thanks to the development of automated survey telescopes, the odds of getting lucky have improved considerably. In October of 2013, the telescope of the intermediate Palomar Transient Factory worked just as expected, capturing a sudden brightening that turned out to reflect the explosion of a red supergiant in a nearby galaxy. The first images came from within three hours of the supernova itself, and followup observations tracked the energy released as it blasted through the nearby environment. The analysis of the event was published on Monday in Nature Physics, and it suggests the explosion followed shortly after the star ejected large amounts of material. This isn’t the first supernova we’ve witnessed as it happened; the Kepler space telescope captured two just as the energy of the explosion of the star’s core burst through the surface. By comparison, observations three hours later are relative latecomers. But SN 2013fs (as it was later termed) provided considerably more detail, as followup observations were extensive and covered all wavelengths, from X-rays to the infrared. Critically, spectroscopy began within six hours of the explosion. This technique separates the light according to its wavelength, allowing researchers to identify the presence of specific atoms based on the colors of light they absorb. In this case, the spectroscopy picked up the presence of atoms such as oxygen and helium, which lost most of its electrons. The presence of these heavily ionized oxygen atoms surged for several hours, then was suddenly cut off 11 hours later. The authors explain this behavior by positing that the red supergiant ejected a significant amount of material before it exploded. The light from the explosion then swept through the vicinity, eventually catching up with the material and stripping the electrons off its atoms. The sudden cutoff came when the light exited out the far side of the material, allowing it to return to a lower energy state, where it stayed until the physical debris of the explosion slammed into it about five days later. Since the light of the explosion is moving at the speed of light (duh), we know how far away the material was: six light hours, or roughly the Sun-Pluto distance. Some blurring in the spectroscopy also indicates that it was moving at about 100 kilometers a second. Based on its speed and the distance it is from the star that ejected it, they could calculate when it was ejected: less than 500 days before the explosion. The total mass of the material also suggests that the star was losing about 0.1 percent of the Sun’s mass a year. Separately, the authors estimate that it is unlikely there is a single star in our galaxy with the potential to be less than 500 days from explosion, so we probably won’t be able to look at an equivalent star—assuming we knew how to identify it. Large stars like red supergiants do sporadically eject material, so there’s always the possibility that the ejection-explosion series occurred by chance. 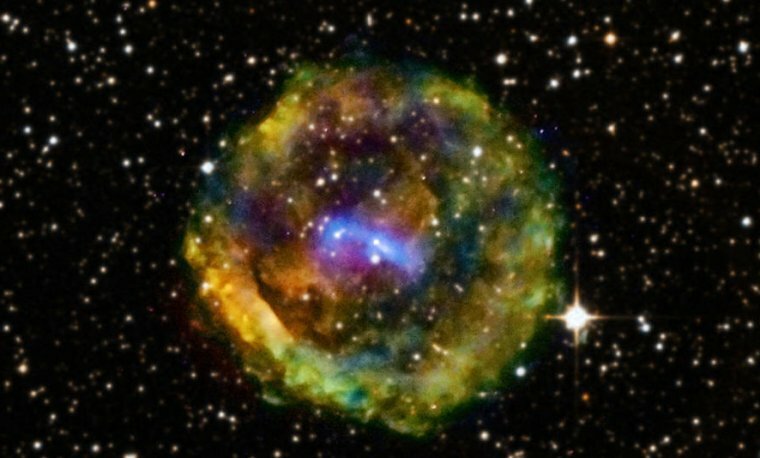 But this isn’t the first supernova we’ve seen where explosion material has slammed into a shell of material that had been ejected earlier. Indeed, the closest red supergiant, Betelgeuse, has a stable shell of material a fair distance from its surface. What could cause these ejections? For most of their relatively short lives, these giant stars are fusing relatively light elements, each of which is present in sufficient amounts to burn for millions of years. But once they start to shift to heavier elements, higher rates of fusion are needed to counteract gravity, which is constantly drawing the elements in the core. As a result, the core undergoes major rearrangements as it changes fuels, sometimes within a span of a couple of years. It’s possible, suggests an accompanying perspective by astronomer Norbert Langer, that these rearrangements propagate to the surface and force the ejection of matter. For now, we’ll have to explore this possibility using models of the interiors of giant stars. But with enough survey telescopes in operation, we may have more data to test the idea against before too long. Ars Technica was founded in 1998 when Founder & Editor-in-Chief Ken Fisher announced his plans for starting a publication devoted to technology that would cater to what he called “alpha geeks”: technologists and IT professionals. Ken’s vision was to build a publication with a simple editorial mission: be “technically savvy, up-to-date, and more fun” than what was currently popular in the space. In the ensuing years, with formidable contributions by a unique editorial staff, Ars Technica became a trusted source for technology news, tech policy analysis, breakdowns of the latest scientific advancements, gadget reviews, software, hardware, and nearly everything else found in between layers of silicon. Ars Technica innovates by listening to its core readership. Readers have come to demand devotedness to accuracy and integrity, flanked by a willingness to leave each day’s meaningless, click-bait fodder by the wayside. The result is something unique: the unparalleled marriage of breadth and depth in technology journalism. By 2001, Ars Technica was regularly producing news reports, op-eds, and the like, but the company stood out from the competition by regularly providing long thought-pieces and in-depth explainers. And thanks to its readership, Ars Technica also accomplished a number of industry leading moves. In 2001, Ars launched a digital subscription service when such things were non-existent for digital media. Ars was also the first IT publication to begin covering the resurgence of Apple, and the first to draw analytical and cultural ties between the world of high technology and gaming. Ars was also first to begin selling its long form content in digitally distributable forms, such as PDFs and eventually eBooks (again, starting in 2001).